Microencapsulated liquid crystals are classically printed on a substrate with a covering film forming a sandwich, trapping the liquid crystals within the layers. 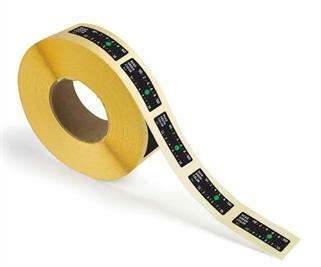 Roll formatted liquid crystal does not require a covering film and is dispensed as a dot from a micro pump on to a base layer, then dried in place. LCR Hallcrest is the International leader in Colour Changing Temperature Indicating Technology and Graphics specialising in the micro-encapsulation of liquid crystal compounds and the development/manufacturing of products, inks, dyes and paints that change colour.